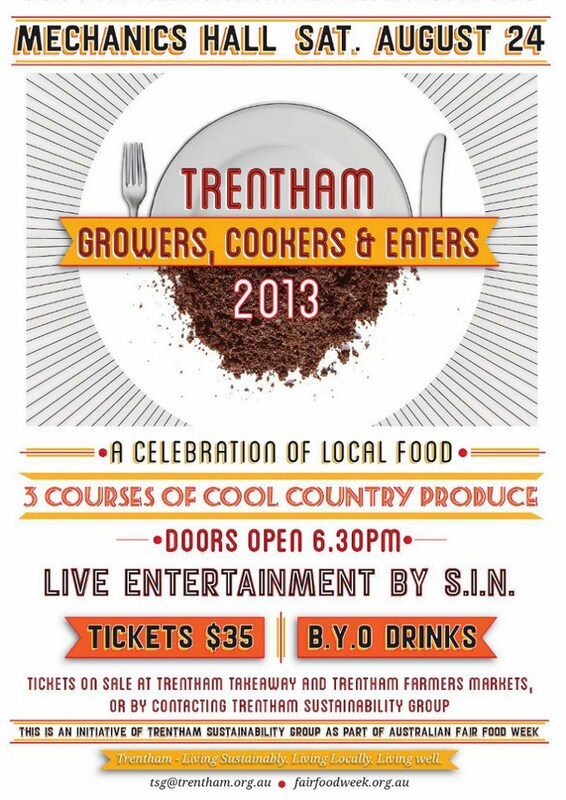 Growers, Cookers & Eaters 2013 - Trentham. Cool country. Trentham Sustainability Group are hosting a community dinner at the Trentham Mechanics Hall on Saturday August 24th. Join us for 3 delicious courses of cool country produce with entertainment by local band SIN. Tickets are $35, available from Trentham Takeaway and Trentham Farmers Markets in July and August. Aside from having barrels of fun and meeting a few new people, you'll also be able to hear an update on the development of the Trentham Food Hub. This event is part of Australian Fair Food Week and all funds raised will go towards initiatives supporting our local food and agriculture industry.